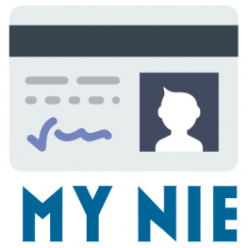 Is a ETIAS the same as A NIE number? And will I need one to work and Live In Spain? ETIAS is a new Visa entry system into The EU area due to be launched in 2021. It is unclear at present if the British will need a ETIAS to holiday, work or live in Spain. A ETIAS is not a NIE Number, nor does it entitle the holder to Spanish Residency. 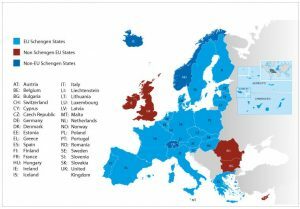 There are many countries who are not in the European Union (EU) whose citizens can enter the EU Schengen Zone without needing a visa. Specifically, there are currently 61 countries who are not in the EU, but are visa free. Citizens of these countries are allowed to go into countries in the Schengen Zone for business or travel purposes for up to 90 days. During these 90 days, these visitors are not allowed to work or study, but can engage in business and tourism activities. In addition, recent security concerns with terrorism and the migrant crisis have called for a better management of who is entering EU borders. The EU has continuously declared its goal of making travelling within its borders a more secure experience. To reduce procedures and wait times, as well as address the security concerns, the European Commission (EC) has come up with a solution – ETIAS. This article will contain all the information you need regarding this new system and whether you qualify for it. ETIAS stands for European Travel Information and Authorization System. It is a completely electronic system which allows and keeps track of visitors from countries who do not need a visa to enter the Schengen Zone. In a way, it resembles the U.S Electronic System for Travel Authorization (ESTA), which serves a similar purpose. The legal procedures to pass the ETIAS have started in 2016, and the system is expected to be in place by 2021. The ETIAS will undergo a detailed security check of each applicant to determine whether they can be allowed to enter any Schengen Zone country. Since citizens of countries who do not need a visa for travel purposes of up to 90 days in the EU do not need to go through a long process of applying for the visa, the ETIAS will make sure that these people are not a security threat. This travel authorization system will gather, keep track of, and update necessary information regarding visitors to determine whether it is safe for them to enter Schengen countries. The ETIAS, besides being used for business and tourist purposes, will also allow people to visit the Schengen countries for medical and transit reasons. In addition, it will be mandatory for all countries who are Schengen visa-free. In his 2016 State of the Union Address, President of the European Commission, Jean-Claude Juncker has said the following: We need to know who is crossing our borders. This way we will know who is travelling to Europe before they even get here. The main reason for the approval of the ETIAS authorization is security. With the increased risk of travelers worldwide, the EU wants to ensure safe travels in its countries. The ETIAS will decrease security concerns substantially through its information and data gathering systems. -All in all, the ETIAS authorization will make travelling to the EU less of a hassle -and a much safer experience. Until the launching of the system by 2021, more countries might be added to the list, but at the moment, all citizens of the above mentioned countries, will be obliged to obtain ETIAS authorization before entering any EU country. How much will ETIAS cost? The ETIAS will not burden your finances a lot. It is planned to have the ETIAS cost only €7 for each application. This is only valid for adults over 18 years old, as those under 18 will not have to pay any fees. You can pay the fee by debit or credit card. Immediately after you complete the payment, the ETIAS authorization will start processing. How long is the ETIAS valid? If approved, the ETIAS might be valid for 3 years or until the end of validity of the travel document registered during application, whichever comes first. Whether you will get the first period of validity or the second depends on the system’s evaluation of your information and risk. What if my ETIAS application is denied? Within minutes of your submission of the application, you will get a response on the status of your ETIAS. If it is approved, congratulations! If not, though, you will get the denial message. In the denial message, you will also have a reason as to why the ETIAS was denied. You could appeal to this decision or based on the denial reason, you can adjust your application and try again. What documents do I need for the ETIAS authorization? Electronic passport chip – which is not necessarily mandatory, but would be an advantage. This chip can be found in the cover page of your passport at the bottom. Can I enter into any EU country with the ETIAS authorization? To use the ETIAS authorization correctly, you must first pass through the first country you stated in your application. If you were planning to go through Germany, Belgium, and Austria, and you stated in your application that the first country you will visit is Germany, you must go through it before you visit Belgium and Austria. After you enter your first country, you can visit any other country in the Schengen Zone for 90 days. However, just because you have the ETIAS does not necessarily guarantee you entry into the EU countries. This is at the discretion of the border authorities. There are countries in the EU, which are not in the Schengen Zone, and you cannot enter them with the ETIAS authorization. How does ETIAS check my information? ETIAS will be connected to many databases which can verify your information within minutes. That is why it’s important for all applicants to give honest responses and not try giving false information. If you are caught giving fraudulent information to the ETIAS system, you will be denied the authorization. In addition, if your ETIAS is approved, but you are later found with incorrect or false information, your ETIAS will be revoked. How long can I fill the ETIAS application? As stated, the ETIAS application is expected to only take about 10 minutes to fill. After 10 minutes, you will receive a notification that your session has timed out and you might be asked to start from the beginning. To avoid this, try to go through the application carefully and save your information. What if I am not eligible for the ETIAS? All citizens of countries in the table above (countries which can enter the EU without visas) are eligible to apply for the ETIAS. If you are not eligible for this travel authorization, it means that you are not a citizen of those countries. This means that you must obtain a Schengen Visa to enter the EU countries. Do I need ETIAS if I have a Schengen Visa? No, if you have a Schengen Visa, then you will not need an ETIAS authorization. You can present your visa to the border authorities when you enter the Schengen Zone countries. When your visa expires, you can apply for the ETIAS if you are eligible. 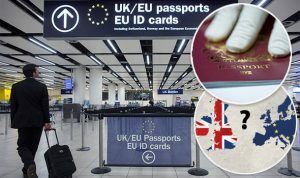 Will British citizens be required to have the ETIAS authorization? Since the UK is going through the Brexit procedures, it is still unclear of what the conditions for Britons wishing to enter the EU will be. However, the British are very likely to fall under the ETIAS program. As the negotiations for the UK leaving the EU proceed, the situation will be clarified and British citizens will understand whether they have to get the ETIAS or not. How many times can I enter the EU with an ETIAS? You can enter the Schengen member states for as many times as you want, for as long as your ETIAS is valid, and you have not stayed more than 90 days in a 180 days period. Are ESTA and ETIAS the same? What are their differences? ESTA is the US equivalent of the EU ETIAS. 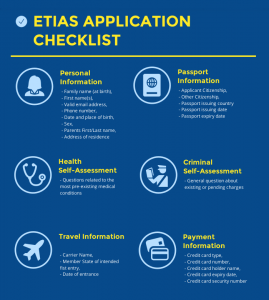 While ETIAS stands for European Travel Information and Authorization , ESTA stands for Electronic System for Travel Authorization. You will not be able to enter the US with an ETIAS, just the same like an ESTA holder is not permitted to enter the EU without having an ETIAS or Schengen Visa. US citizens, who are permitted to enter Europe visa free, after 2021 will have to obtain an ETIAS prior to their trip to the Schengen Zone. What is the difference between a Schengen visa and an ETIAS travel authorisation? A Schengen visa is a sticker affixed to your passport, which specifies the amount of time you are permitted to remain in the Schengen Zone, whereas a travel authorization is an electronic permit which serves for the same purpose. While you will have to follow a weeks-long procedure, which includes gathering a lot of documents and attending an interview, you will be able to complete the application process for an ETIAS within minutes. Do I also need an ETIAS if I have a Schengen Visa? If you have a Schengen Visa, that means you are not part of the list of the countries, which are visa-exempt. Therefore, you will not need an ETIAS authorization. You can present your visa to the border authorities when you enter the Schengen Zone countries. When your visa expires, you can apply for the ETIAS if you are eligible. Do I need an ETIAS visa if I already have a long-term visa from one of the Member States? Since a long-term visa issued by one of the member states gives you the right to move throughout the whole Schengen, you will not need to obtain a travel authorization for as long as you have the visa. An ITIAS is not the same as Apply EU Settled Status. Do infants and children need ETIAS? Every traveler, even infants and elders will need to present a travel authorization upon their arrival in Schengen in order to be permitted to enter. However, people under the age of 18 are exempt from paying the fee. Can a travel authorization be revoked? Yes, a travel authorization can be revoked or annulled if the conditions for issuing the travel authorization no longer apply, or if the travel authorization holder is found to have violated any of the ETIAS rules. This is a list that consists of data on people who are suspected to have committed, or been part of a criminal offence (as terrorism). The ETIAS watchlist will be established based on the information provided by Member States and Europol. When will ETIAS be implemented? It is believed that the ETIAS will be operational in January 2021. Hi, im looking to move to benidorm this year. Is an ETIAS the same as a NIE number? Do I need to get a ETIAS and a NIE Number in spain? 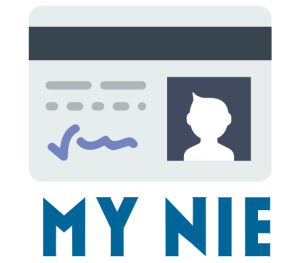 Previous Previous post: Why is a NIE Number important?